Top Ten Scariest Movie Villians Ever! Every kid is scared of the monsters in the dark at some point or another. Freddie Krueger takes the terror one step further, haunting your sleep with his razor fingers and the threat that death in your dream translates to death in reality. Get ready to make your friends wet the bed! Let’s be honest – anyone who has ever been to Miami can attest to the gruesomeness of ridiculously leathery skin. Guess what makes that already gruesome image even more horrifying? When the reason for the leathery face is because the guy is wearing a mask that’s literally made of human skin. Throw in the fact that the guy lives in a house made of bones and wields a chainsaw and it’s the stuff of nightmares! You can’t reason with him, because he doesn’t talk. You can’t defeat him, because he’s indestructible. The best you can hope for is survival – and given his machete-wielding mass-murderer tendencies, the odds are against you. Jason definitely has a spot on this list and in our worst nightmares! You know what’s creepy? Evil children (just see The Grudge or The Orphan, you’ll get it). You know what’s even creepier? An evil child locked in adolescence who comes back as an adult with his still decidedly juvenile face and the same thirst for blood that led him to kill his own sister. And this time, he’s coming for you! This one doesn’t need much explanation. A lot of people are scared of your standard issue carnival clown, so capitalizing on that by adding a murderous spirit and evil superpowers is definitely going to be terrifying! The Purge was so popular that they made a sequel because the idea of any normal-seeming acquaintance harboring some evil in them is bone-chilling. 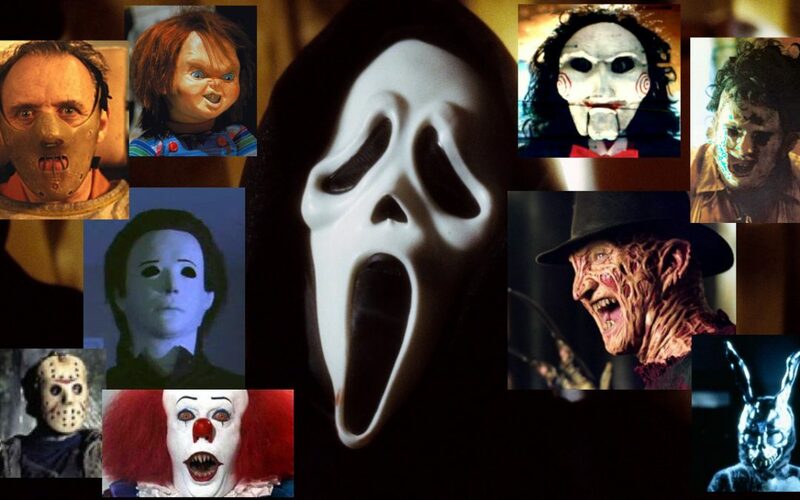 Ghostface, a disguise donned by a number of different characters, is terrifying for the very same reason! He should be fluffy and cute, but instead he’s overgrown and dark, anticipates the end of the world, and seems to take over otherwise harmless personalities by turning them into murderers when they don the costume. He can kill you, or worse – he can make you a killer! He’s a twisted old man who likes pushing his victims to the edge with the very worst inhumane forms of torture that you can imagine – and then some. If he really existed, I might never leave my house again. Again with the evil children! Only Chucky isn’t just a child – he’s a toy. And his should-be innocent little toy body is inhabited by the demented soul of a serial killer. You’ll never look at dolls the same way again. Last, but certainly not least, there’s Hannibal Lecter. He’s a brilliant doctor, but he’s crazy. He will outwit you, kill you, and eat you – but possibly not in that order! No matter which of this blood-chilling villains you choose, you’re sure to strike terror into the hearts of your friends!